The Canadian passport is one that is issued exclusively to the citizens of Canada. A Canadian passport like other passports enables the holder to leave and enter Canada and in line with visa regulations and limitations to travel into other countries and leave as well. It is important to note that the Canadian government is the sole issuer of the Canadian passport more specifically IRCC (Immigration, Refugees and Citizenship Canada) and does not allow a third party to do the same. The Canadian passport helps an individual obtain the services of the Canadian consular officials while being abroad. It could also secure protection, if need be, to an individual abroad. Passport services can be issued through the various offices situated in the various cities in Canada, for instance, Toronto and Vancouver. The passports are usually valid for five or ten years for a holder who is 16 years old and older and for children under the age of 16 years the passport is valid for 5 years. As said initially to apply for a passport one must be 16 years or older. Passports issued are 36 pages. All children who are citizens of Canada should have their own passports separate from their parents in order to travel. The child’s passport is only valid for 5 years. It is important to note that passports of children are valid for only 5 years even if the child reaches age 16. In the case a holder loses their passport, there is a process of renewal that is followed. Canadians living I the USA can apply through the postal office or online through email. When applying for a passport, applicants required to fill out a guarantor on the forms. Its main function is to act as a security precaution and reference point to investigations if need be and is usually on the application form. To apply for a Canadian passport, only another holder of a Canadian passport can act as a guarantor. However, there might be cases such as a Canadian citizen living abroad and does not have a Canadian guarantor. In this case, a person who works in one of the licensed professions might suffice. Those are such as dentistry, medicine, law, or a person in a financial institution. A person might have their Canadian passport revoked or declined an issuance of a new passport or declined renewal of an expired passport. The IRCC have the right to do so if an individual fails to complete and submit an application, provides misinterpreting or misleading information. When applying for the passport or has a criminal background that does not meet the board’s requirements. It important to note that a passport may revoked or declined a new one due to the security and safety threat the individual applying for the passport bears with them. 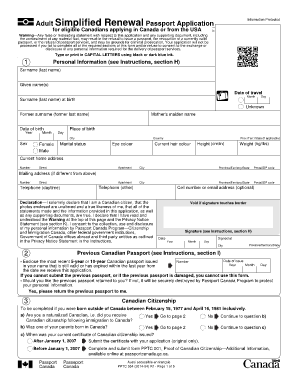 Canadians started issuing this new passport format to Canadians from 2012 onwards. The e-passport has a chip that features the holder’s name, their gender, place of birth coupled with the date and finally a small digital picture of the holders face. This new advancement also came with the option of a 10 year validity period as well with the 5 year period. According to Passport Canada, the electronic passports will allow Canada to comply with international standards, rules and regulations especially when it comes to security in order to help prevent harm coming to its borders while still making for an international travelling experience for all Canadians. With the inclusion of the new electronic passport, Canadians now have to choose between the 10 year period of validity or the 5 years one. The previous 5 year validity period used to cost holders about 87 dollars, but now the cost has slightly gone up and is 120 dollars. The 10 year period will cost an adult 160 dollars and to a child, it will cost 57 dollars but it goes up to 15 years in validity period. There are also applicable fees and costs that come with holders of passports losing their passports. All fees payable only in Canadian dollars either through credit cards, debit cards or cash posted to the relevant passport office. Canadian passports made and designed to ensure that the citizen of Canada have a smooth and enjoyable travelling experience. It also ensures that security and safety of Canadian residents preserved and parity maintained at all times. With the new enhancements, it is hard to ignore the fact that they have made passport related services easy, effective and efficient, thus reducing the inconvenience that holders and citizens of Canada initially had. If you are outside of the USA and Canada, to get the Passport program info call 819-997-8338 Phone number.